A potato is just a potato, right?? What is with all of the colors? Those purple ones…are they really potatoes? Find out what is special about each one of 8 potatoes we grow! Blue Potatoes – This beautiful potato is full of antioxidants because of its color. It has a sweet, nutty, earthy flavor and is perfect for boiling, baking, mashing, grilling and frying. Butterball Potatoes – A creamy, rich, buttery potato. Perfect for steaming, baking, frying & mashing. Fingerling Potatoes – This potato has an earthy, nutty flavor. Good for roasting and steaming. Purple Fingerling Potatoes – An antioxidant packed potato because of its beautiful purple color. It has a dry, earthy flavor and is good for roasting and steaming. Red Skin Potatoes – This customer favorite has a mild, earthy, buttery flavor. They are perfect for boiling, mashing, baking or roasting. Russet Potatoes – This dry potato has a mild, earthy flavor and are good for baking, mashing or fries. White Potatoes – The white potato is more starchy and has a rich, nutty flavor. It is perfect for baking, roasting or frying. Yukon Gold Potatoes – This all purpose potato has a creamy, buttery flavor. It is great for roasting, grilling, mashing, sauteing and boiling. The best way to store your potatoes is in a cool, dark place. **Note: In the early summer when we have our new potatoes it is important to keep them in the fridge! The new potatoes are dug when the plants are still green and the skins are very tender. Potatoes are one of our favorite things to grow. 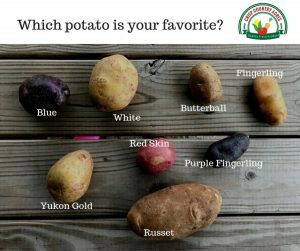 While we love to eat them all I think some of our favorites are Red Skin & Yukon Gold potatoes. Of course, Red, White & Blue potatoes are a must during the summer holidays! Let us know below which kind of potato is your favorite!